An appeal was last night launched for missing 'Kipper Raymond Finch, TBG can reveal. Despite winning a seat on Hampshire County Council to represent the Bedhampton and Leigh Park Division last May, being a personal assistant to Nigel Farage in London and candidate number four for the European Parliament elections, Finch has been very conspicuous by his absence since missing out on becoming P.P.C for Havant earlier this year. So much so that constituents have even been writing to the local paper voicing concern at his notorious attendance record both in public and at council meetings. Local Lib Dem Faith Ponsonby told TBG earlier that she found it "odd" and "interesting" that UKIP "haven't fielded a single candidate" in the county ward Finch won in a protest vote last year. 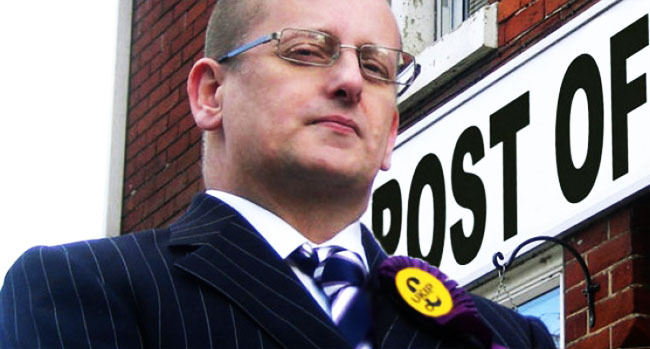 As TBG reported Saturday, a candidates crisis exposed by TBG way back in February means UKIP are fielding just six candidates out of a possible fourteen for Havant Borough Council even though Finch was fully eligible to stand. Is he holed up somewhere with Mike Hancock? Is there something we should know?